I am considering using the Ratio remote signal control lever kit and Bowden type cable to control points . I have six points to control all fairly close to each other. Using the Ratio levers as a ground frame and the Bowden cable to control the points. Any tips and advice gratefully received. I had hoped that someone else might have replied to you regarding the Ratio remote signal control kit. I have absolutely no experience with them and even had to look them up to see what they were. I take it you mean the Ratio 250 kit? I would be very interested to learn how you get on, even if I am unable to offer any advice. With the conditions we have to endure outdoors I am sure that some kind of manual control for our points would be a worthwhile experiment. I had a quick read through some of the search results I was presented with when searching for the Ratio kit and there were reports of the cord fraying after a period of use but if you're considering Bowden type cables then that wouldn't be of concern. I did think about some form of manual control for the point I installed at the rear of my shed as it's within a reasonable distance but in the end I went down the electronic route as before, although it does use a basic mechanical linkage from point motor to tie bar. Perhaps I could (and should?) have taken the idea further? As I said, I would be interested in how you proceed so please let us know how things go. I have ordered some Ratio 250 kits and the 1.5mm Bowden cable. I'll keep you updated on my progress. Well my Ratio 250 signal lever kits and the 1.5mm cable have arrived. Whilst waiiting I did some research as to how other modellers were doing it. It seems that Mick's comments regading the cord fraying were well founded. Apparently a good alternative to the cord is fishing line running through dolls house screw eyelets. A small weight is fixed to the signal end of the line and routed through the baseboard just beyond the signal. This keeps the line taught. Regarding the Bowden cable, I researched a suitable tube to run the cable in. I found a brilliant suggestion..... net curtain wire! That springy plastic covered stuff. My 1.5mm cable fits inside it a treat, as it's teflon coated it has low friction. I have made up a test rig to try my Bowden cable idea. It all works well. I do have concerns however, there is a weak point where the lever meets the actuator. If there is any resistance in the cable I think it will break. For this reason I'm going to use the Ratio lever and fishing line for signals . During my trolling various websites for info I came across a metal lever frame made by Mercontrol and sold by Lychett manor models. They come in 4, 6 and 8 lever frames and looks like they can be joined together. I have ordered the 6 way costing £18. More updates when it arrives. If anyone has any more info or experience of this type of system I would be most interested. Further updates. The Mercontrol groundframe has arrived. A sturdy cast metal frame with brass levers. These levers are a bit flimsy but seem to work fine. I have made up a test rig with a point to try it out. The piece of blue tube going under the track is a cotton bud with the cotton ends cut off. I think this project has legs but further testing is required. One thing I did find was that net curtain wire has become thinner. I have had to buy 1mm Bowden cable inner as my 1.5mm doesn't fit in the new curtain wire. I have not given up with the ratio levers yet, I do prefer the look of them. Once I get a long cable fitted on the railway to control a point 12 foot away I'll have a better idea. Any thoughts would be very welcome. The Mercontrol groundframe certainly looks the part Dave. Are you planning on using the fishing line on outdoor signals? Signals are on my 'to add' list (among other things) and I'd really like to be able to install and operate them the 'mechanical' way. All these chips and decoders are fine but there's nothing like operating a lever rather than push button. Not sure how I'd route a linkage some twenty or thirty feet round the layout though or even whether that would be feasible. The linkage to your test point is very similar to how mine operate, albeit with the aid of a decoder and point motor rather than a cable. Mechanical just seems so right. I do intend to use fishing line outside. I have bought a reel of 3lb line and a pack of small screw eyes. I will have to make a tool to fit the screw eyes to the baseboard as they are fiddely to hold. If it is dry this weekend I'll have a go at fitting the two signals with the longest run, about 20 feet each. I will of course let you know how it goes. Mick, I have been reading your thread of last year, on kadee couplings. You indicated that you wanted remote decoupling. 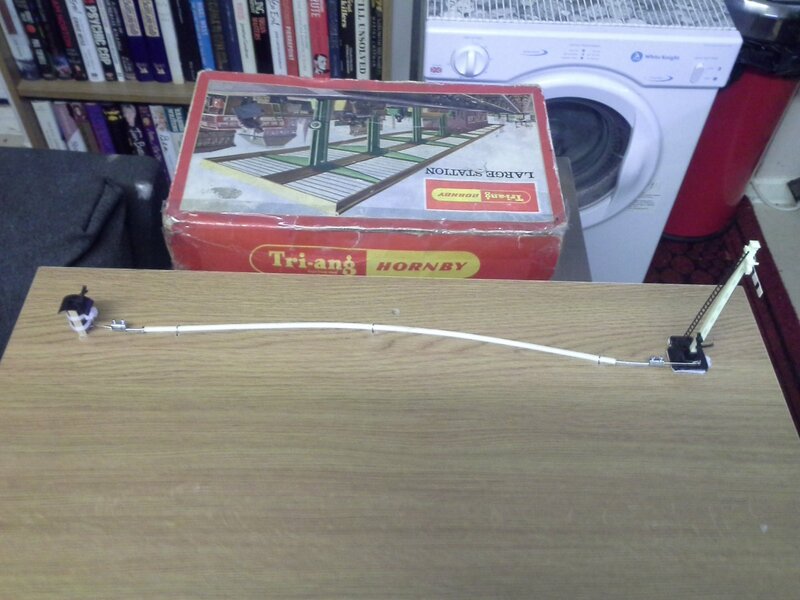 Maybe we could extend this system to activate a Hornby decoupling ramp, in place of the point motor. I'm going to try it on my carriage sidings. Meanwhile I'll rig one up on my test board. Having carried out my tests on the Ratio signal levers and the Mercontrol lever frame. I have come to the consultation that I prefer the Ratio levers. They look better and are more comfortable to operate. The metal frame of the Mercontrol is extremely fiddly to use as the levers are so close together. 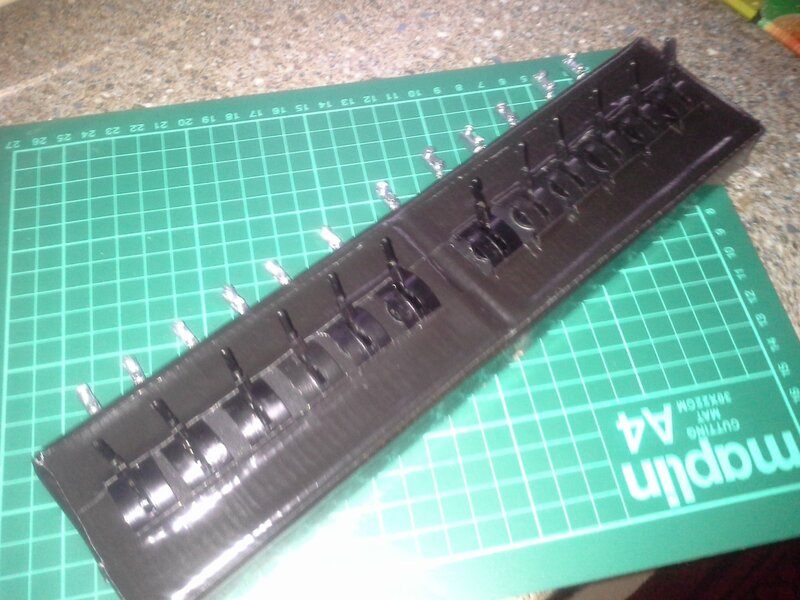 I have made up a 12 lever frame using a pair of Maplin boxes and paperclips for control rods. All the levers are Ratio 250 remote control kits. As soon as the weather is good enough I will try it out. I will report back soon. That looks a neat Job I'm impressed! WOW! Those ratio levers look awesome. About how much do they run price wise? ok, I guess I can google it myself. A kit to remotely operate a signal (ratio 250) is around £5 each, they come with extra parts like cord and screw eyes. I have got hold of some Ratio 134 kits they have 2 levers only also around £5. I found ebay a good source. Here is a short report on testing of the Ratio plastic lever frame. As I feared if there is any resistance in the prodding or Bowden cable the bottom linkage within the lever unit will break. However the system works well with signals which are pulled off by cord and screw eye method. I have made up a battery powered, switch controlled servo unit to try. Same Bowden cable and cord system just an electro mechanical operating system. Having tested my electro powered groundframe which works well, I felt that I was cheating. I went back to the Mercontrol leverframe and changed all the wire in tube bowden cable for cord. Using a heavy duty braided fishing line. This is spring tensioned and so far so good. I will let the weather get at it for a few days and report back. Is this any use to you? Thanks for the video Roddy. That is a very impressive lever frame. Definately food for thought. All my control gear is on the surface of the baseboard, a small modification to the frame would accomodate surface oporation. Great idea for bellcranks, I will be giving that a go. My latest Mercontrol groundframe has arrived, they seem to take a month to arrive once ordered. I have installed it today and finally I have all the points mechanically controlled plus semaphore signals. Two of these are 17+ feet away! When I pull off a signal it behaves very much like the full size version. Very satisfying pulling a (albeit small) lever and seeing a point move some distance away. Heatshrink sleeving gives the lever colour. I think I had better tidy up the original frame it looks a mess.